The Santorini teachers’ theatrical group is putting on “The Fools”, a romantic comedy by the American writer Neil Simon, which takes place in a small village of Ukraine. The story follows the teacher’s efforts to break a curse that makes all the inhabitants of the village stupid! 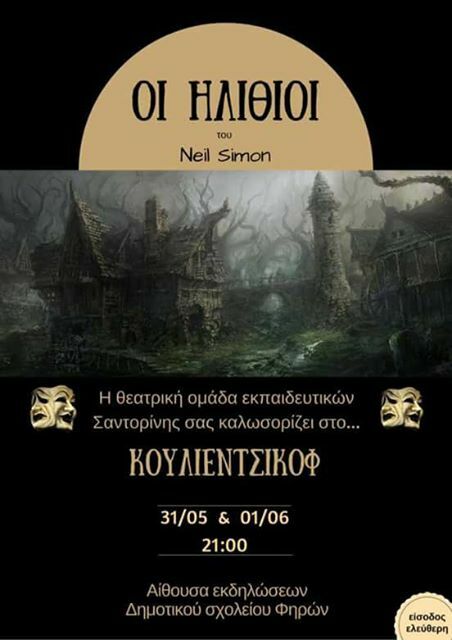 The performance is in Greek and takes place tonight and tomorrow at 21.00 in the hall of the elementary school in Fira. Entrance is free.